Today’s post has two shameless, self-serving objectives. The first is to raise awareness of Melbourne Cupcake Day, an alternative first-Tuesday-in-November event for those who prefer sweet treats over losing money and throwing up. It deserves to be a phenomenon – the bake-off that stops a nation (better slogans are welcome). 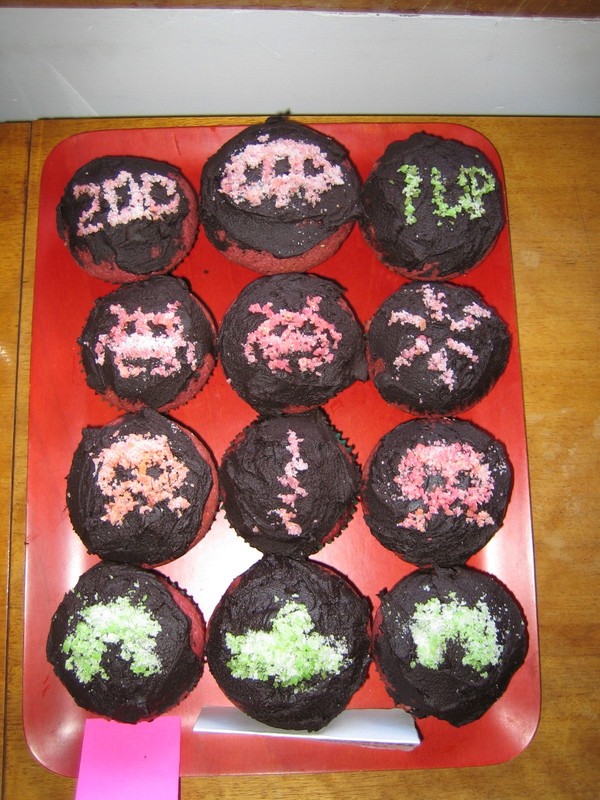 I admit they’re not the most beautiful things in the world, but those are red velvet cupcakes topped with space invaders made of pop rocks. It’s my belief that that is exactly the sort of thing the internet loves, so I’m going to put it there and see how long it takes for the first search engine hit to land. Take it away, Alta Vista! And while we’re on a slightly retro topic, there’s something I’ve always wanted to say about Space Invaders, the game. It was hugely popular in its time, so much so that for me and my peers it became the generic name for all video games (“let’s go play the spacies!”). Someone please make a version with them in it. That would be so cool. Or at least so claimed the graffiti I saw on the way to work this morning. But is that really true? My first guess would be “of course not!” But I’m having trouble thinking of txtspk that rhymes better than “C U L8TR L E G8TR”. Can anyone suggest a better one? A mobile limerick, perhaps? Or maybe we should just change the rules, so that instead of 160 characters, each SMS has to be 17 syllables? As the kids say*, that would be totally Obama. * At least so the Sunday Age assures me. But really I’d rather go with the bloke outside the pub last night, who claimed the band inside was “totally off the hook”. Right on.